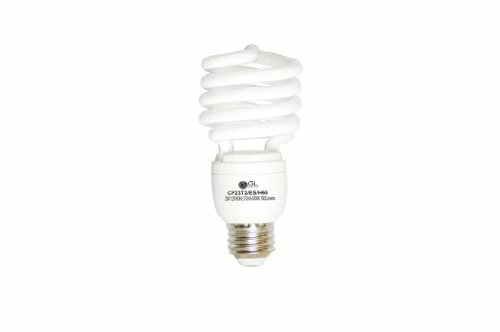 Compact Florescent Light Bulb (CFL) offers long life and quality energy efficient task lighting in a broad range of colors and sizes to fit any décor. Whether you want to create a comfortable, pleasant atmosphere in your kitchen or bath or bring the outdoors in with a bright white light similar to natural outdoor light for any room in the home, Goodlite line of CFL can meet your needs. Most fluorescent bulbs are straight (linear) but some fixtures use circular (Circline) bulbs, while other fixtures use a U-shaped (U-bent) design. Fluorescent bulbs are available in many colors, or color temperatures, which create different light moods. Color temperature is a measure of the light bulb's color when illuminated, and is measured in degrees Kelvin. The higher the number, the whiter, and then bluer, or cooler the color. The lower the number, the more yellow, or warmer the color. The color of the light itself creates a mood in the lighted space. If you have any questions about this product by GL Goodlite®, contact us by completing and submitting the form below. If you are looking for a specif part number, please include it with your message.